On the first day of 2008 we have had all sorts of water adventures. Seemingly it wasn’t the just the pump playing up. Now it’s the valves. So after much gnashing of teeth we spent the day kicking the water system to get it to spring into life. Oh the joys of country living. Having said that, I’d rather had idiosyncratic water that works than heating that doesn’t. Commiserations to the ST and RD and my nephews who have suffered in the chills of London for a few days. I’ve decided to make many new year’s resolutions this year and just see how the year unfolds. Since 2007 was a relentless ride of schedules, milestones and goals to achieve I’m rather hoping for 2008 to be the year we just enjoy the moment. That’s not to say we don’t have plans or things we want to achieve. But rather we’re going to take life at a more leisurely pace. Since I slept in this morning until 0640 a first for months and months the New Year is off to a good start in my book. Not so good as far as the puppies were concerned who we almost cross legged waiting to be let out! As far as the blog is concerned, I know I have to work harder at keeping entries more regular and just for Nat, a little more spice required. 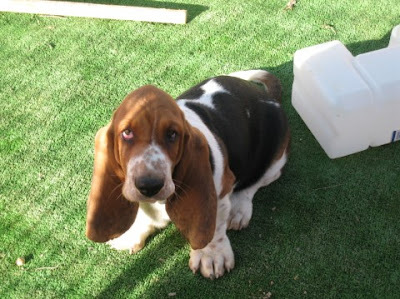 I am sure that the tales of building and puppies can get a little tedious so I’ll see what I can do. Keeping a blog makes you realise how ordinary life can be but I’m sure if I look and think harder I can make even the ordinary seem special enough to share with bloggers. At last look over 200 people a month read this blog which is an amazing number. I’m touched by the fact that people take the time and energy to catch up with all our news. So, happy 2008 to everyone. I hope that you get all that you hope for in this special year to come. 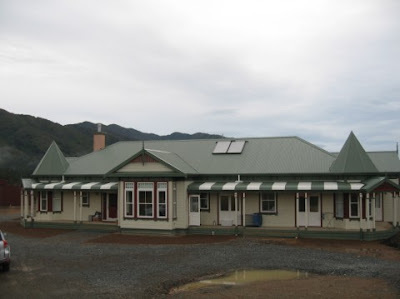 Neighbours – who’d have them?! Hurray, new neighbours. After the steers were moved from the the paddock it’s been lonely with no friends to talk to. Fear not, we’ve got new neighbours this week. 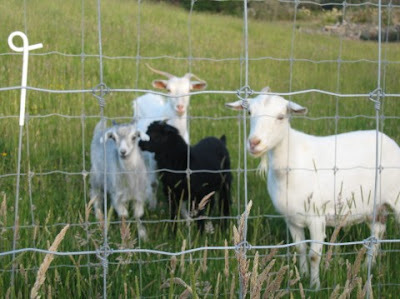 The dinkiest, sweetest family of goats – billy, bessy and their little kids. Dramatic scenes today though as I turned into the lonely goat herder. They obviously didn’t like the paddock much and escaped to be found wandering on the highway. I did manage to get them back although MT doesn’t think I’ll make the next round of “one man and his dog”. Whilst I did marvellously for style, there were a few penalty points for taking the goats into the neighbours garden and then a slow move back down the lane to their rightful place. Whilst they may look happily through our fence they escaped again tonight….. can you believe it. A few words were spoken to the neighbours house sitter (well dog and goat sitter). Hopefully he’s mended the hold in the fence and they will be around for while. 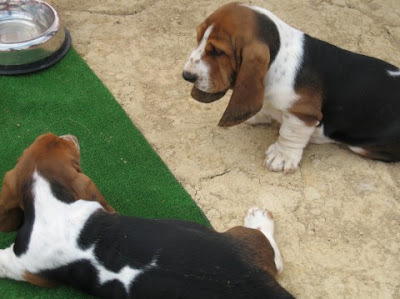 The Bassets are curious but not interested enough to make friends. That’s tomorrow’s excitement. 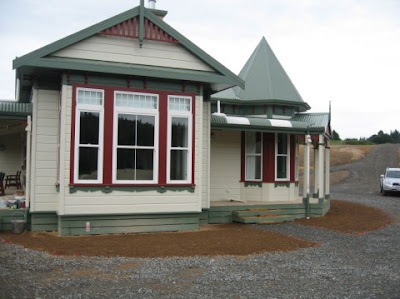 Regular blog readers will know that there are all sorts of exciting things we experience living in a rural area. 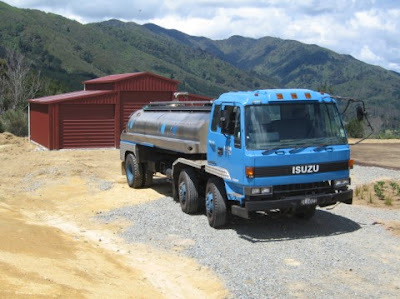 One of which is having a rural water supply. What this means is we collect the rain from the roof, fill the tank and then pump it back into the house via a fancy filtering system. Very ecco you may say and yes it is. 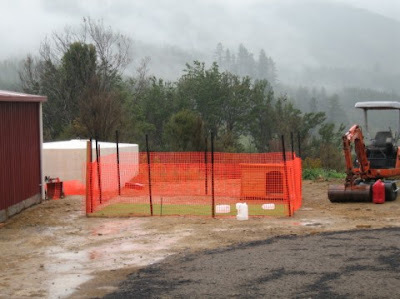 However the success of this system relies on two key things – rain and a working pump. Yes you’ve guessed it. We’ve had neither recently! First it didn’t rain for weeks and weeks so that the water supply dropped to worrying levels. How embarressing would that be to have visitors and no water? So what do you do when the ritual rain dance of Kaitoke failed? 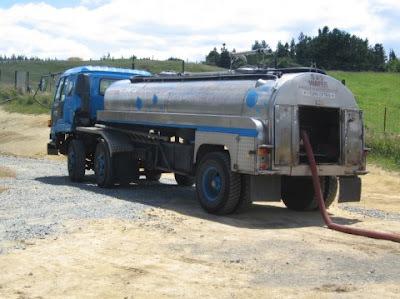 You get a man to deliver silly……yes, the lovely Colin and his shiny truck brought 10,000 litres of water to save the day in time for Christmas. Great got the water. Now the issue is that the pump decided to give up the ghost on a Sunday morning! In the 2 hours that we were without any form of water pump it was most definitely a worry. Makes you realise how you rely on (a) water and (b) electricity to drive the pump. Need contingency for both future eventualities. In the meantime you can be reassured that we’re celebrating the new year with our domestic water supply doing what it is suposed to do. 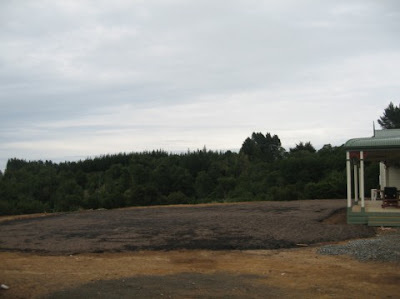 Now all we need is more rain and an alternative power supply – but that’s for another day I think. I know that this sounds like a cheap excuse for not blogging but it really has been full on. Festive domesticity is always a challenge but for this domestic executive in this year it’s been more challenging than most. Fortunatly my just in time methodology served me well and we didn’t miss out on any of the essential festive treats. 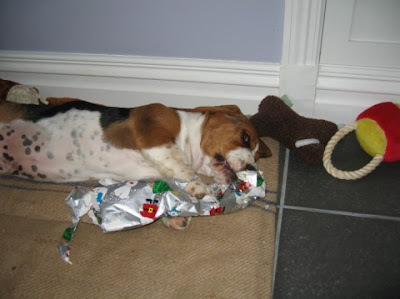 We had presents to unwrap, food to scoff and plenty to drink. Also, we found the fancy china from our secret storage place and dusted off the Christmas decorations to put a bit of festive cheer. Now I am ready to relax. To live for the moment and not the ones coming up. I am officially on domestic executive leave and looking forward to enjoying some sights and r&r to recharge the batteries. With this new found time I might actually find some time to do some blogging more regularly, now that would be a novelty eh! 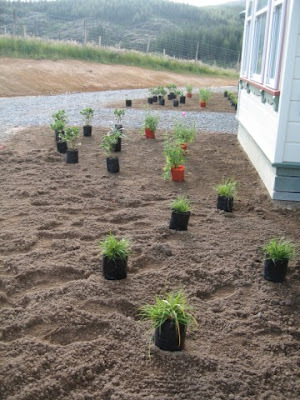 My parents project since they’ve arrived is to help turn the landscape planting plan into a reality. We’ve been cruising to nurseries and the internet to find the array of plants specified in the plan. Having tracked down about 100 plants then the challenge of placing them in the right spot started. After lots of tweaking we finally got them where we think they should be. Next step is to dig the holes and put them in to create the first bit of our new garden! 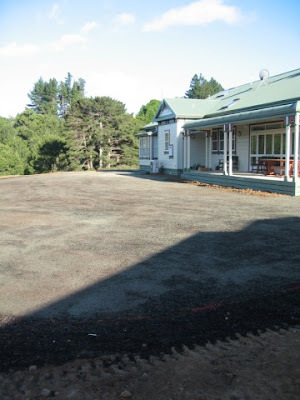 Yes there is a lawn there – or at least lawn seed! 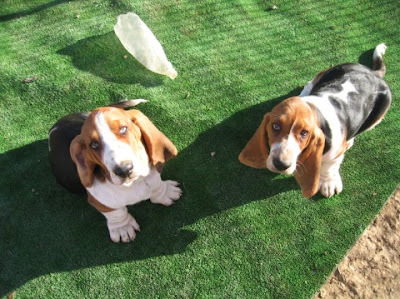 Our Bassets, Fortnum and Mason, are worth their weight in comic value. I’ve not laughed so much in years. 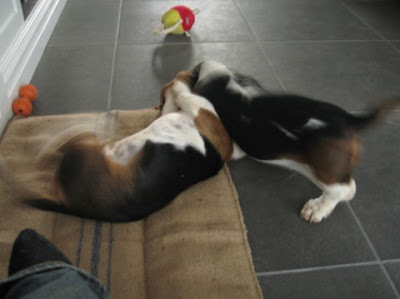 I can watch them for hours at play which is pretty rough and tumble – well they are boys. 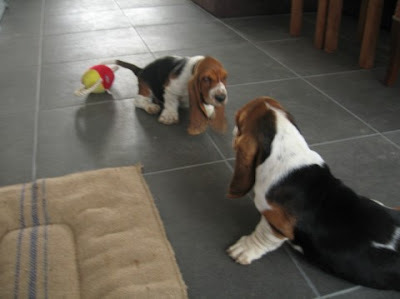 Play is how puppies learn and my boys are no different although I think that they think that they are cleverer than they really are. After all the cunning sideways glances to pretend that they are not playing any more only to then swing around and leap on top of each other is pretty transparent to the human eye but they just love to surprise each other. Hooning, is a traditional kiwi youth pursuit where you hoon around in your car making as much noise as possible and drawing attention to yourself. 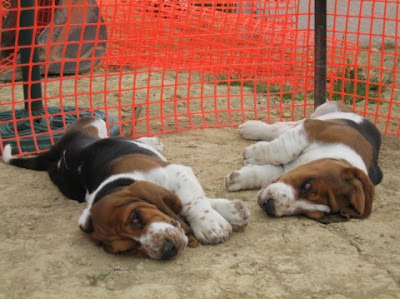 Bassets like to hoon but without the car. 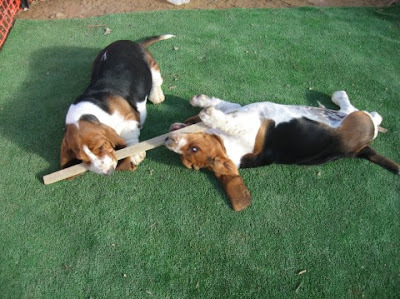 Generally speaking this is after they’ve eaten, done their business and are refueled and comfortable for more play. Hooning hour in the evening can be quite exhausting at the end of a long day but boys being boys there is no stopping them. 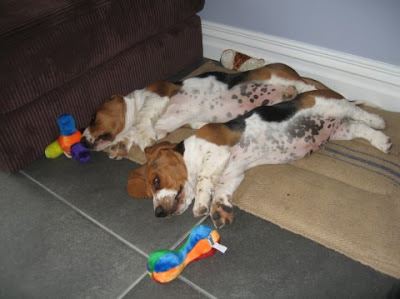 What’s funniest of all is that just like cinderella at the witching hour, around 8pm every evening our puppies are just pooped out and flop into their bed and snooze the night away until its time to start playing again in the morning. Not a bad life eh! It wasn’t us, we didn’t do it! This time with a stick! 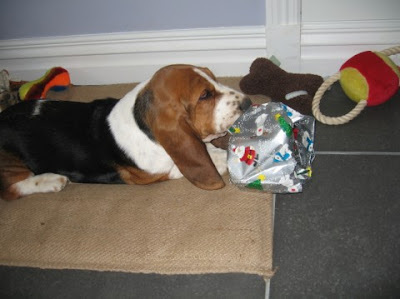 Bassets’ first Christmas was full of excitment. Lots of paper to chew. 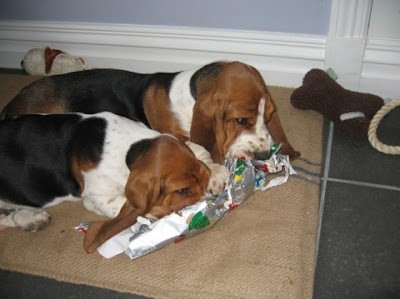 Fortnum and Mason were not forgotten by santa although they were a little unsure of what to do with their parcels from under the tree! I feel like I’ve been motoring at a million miles an hour this week. 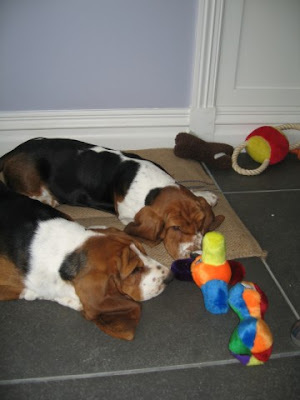 There are puppy routines to manage, builders to coral and family to organise for. Still, I’m over the hump and now heading into the middle lane towards the slow lane for the holidays. Quite unexpectedly I was also called to present for some coaching business with a large Government department. I needed it like a hole in the head in terms of current priorities but need to invest for future. Although technically I’ve finished with MSD I’m still playing flexi time to pay back for the time owed when I was up to my neck earlier this month. All in all it’s felt quite stressful but this evening as I finished my domestic responsibilities (fetching the washing in) I got a lump in my throat when I glanced back at the view. 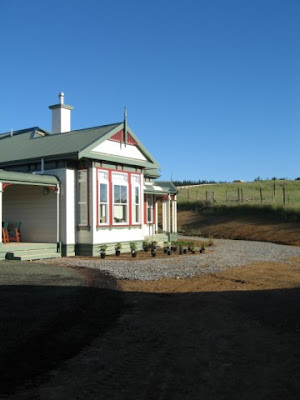 It’s an amazing place we’ve found here in New Zealand and whilst there is life in the fast pace inside the house you just need to look around and life moves at a natural pace in a complicated yet stress free way. Trying to pick up on the country pace I’ve failed to get my photo blogging done this weekend. But tomorrow is another day! It’s quite something to see the lanscapers turn our “cow pat” into the start of a garden. 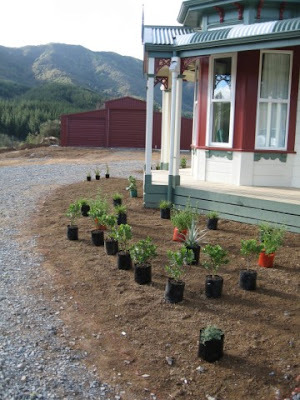 The front flower beds are now in with work in progress to the side of the house. The lawn area is looking good although there is one patch that will need a bit more work as it got flooded when the rains came down today. 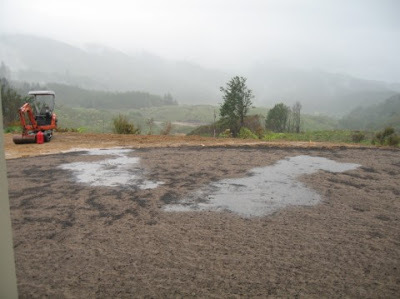 We’re very excited about the rain arriving to fill up the water tank! 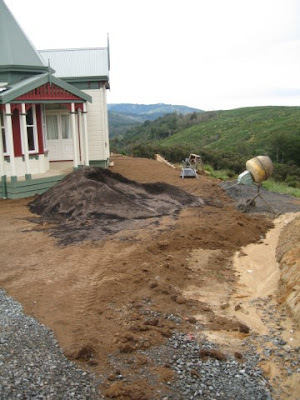 Hopefully we’re on the home run with the final bits of construction and then we can start planting – the really fund bit. 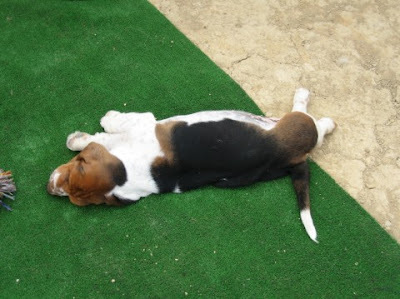 Our landscapers have done a great job on the temporary puppy play pen. 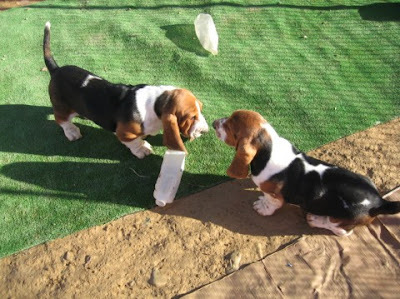 This keeps Fortnum and Mason very happy being able to play outside. 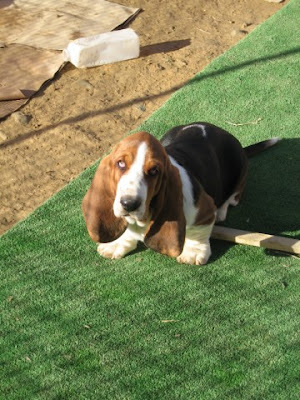 It’s all mod cons you know – special soft washable grass, smashing dog house and lots of room to run around. It’s an ideal spot for people watching too. 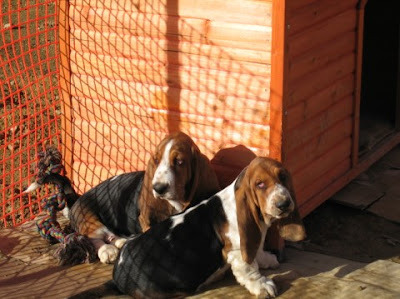 Note picture taken after rain arrived – it was beautiful sunshine when the Bassets were first playing there!